as robert millar was once quoted as saying 'there's training, and then there's training', and never a truer word was spoken. having not had the need for a training plan of any description, any so-called training in which i have participated, has been gleaned from some of the excellent books that velopress have sent for review. thus, there is every possibility that my piecemeal approach has had more flaws than benefits (because i tend to incorporate the bits that i like, rather than the stuff i need), but gave me the necessary bragging rights in the office of a monday morning, and a series of ever increasing numbers on the occasional garmin. nowadays i adhere religiously to advice given by chris distefano: 'start slow and taper off'. as i intend to live until the grand old age of 180, i have a good few decades to go yet before i reach middle-age, but already, any thoughts of being competitive have been shelved in a safe place (and if put there by mrs washingmachinepost, then there's not a chance they will ever be recovered), and i am enjoying my travels across the outer edge on the cielo; as long as i can still get to the top of the hill before the mighty dave t, then all is well with the world. however, i do not identify as your average cyclist. if the articles featured weekly in the comic, and monthly in c+ are anything to go by, and i would find it hard to believe that both do not understand their target market, then thousands of you have training requirements that need to be constantly fed, enhanced, upgraded, downloaded and taped to the handlebar stem. so perhaps the post's substantial readership simply hangs out here for a momentary respite, before once more digging in: no pain, no gain. yes, i'm aware that things are a might more scientific nowadays, but the only part of this scientific approach that i generally hear from those engrossed in its minutiae, concerns the hill reps, fartlek, base mileage, strength training, heart rates and power output. but as i understand the human physiology from the point of view of an innocent bystander, is that in order to progress with these efforts, a certain amount of rest must be added into the equation. in fact, a heck of a lot of rest. yet, while there are dvds, and thousands upon thousands of words covering the active part of cycle training, i can honestly say that the only rest of which i have been aware is as a part of recuperation from injury. i do not readily recollect reading chapters on how, when and precisely why this rest should be shoe-horned into the grit and determination. because it's not just rest, as in sitting in the armchair with a copy of the comic on your knee, or dropping in at deb's for a soya cappuccino and a browse through the house copy of the comic. everybody does that sort of thing. so just as getting the miles in has devolved from its premier status in the training panoply in favour of quality, not quantity, the very same criteria should, apparently, be applied to rest and sleep. aha, sleep, that word that describes just how you'd likely feel after knocking off another five hours before breakfast; how hard can that be? the majority of washingmachinepost articles are handcrafted to a length that has them finish just as the reader begins to nod off. with one or two exceptions, all of us can fall asleep, especially while at work, so it turns the system on its head to look at it as part of work rather than necessarily as a reaction to it. and i can assure you that i'm not the first to take notice of this. the porsche human performance centre employs a number of highly qualified sports personnel along with state-of-the-art facilities to enable any customer, whether they be an entire team such as endura, or the well-heeled individual, to make greater strides towards excellence than would perhaps be the case otherwise. 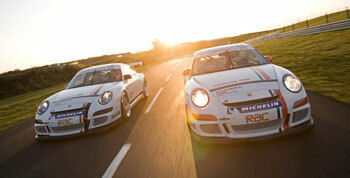 nowadays it's all about those last few seconds or kilometres per hour. but digression has returned us to the act of pummelling that body in an attempt to better its physical properties. i thought we were about to talk about the nice part of training where we can all get some sleep. well, i perhaps haven't gone as off-topic as you may have at first thought, because we are still, at the moment, concerned with the endura racing team. in addition to forging the relationship with porsche (so to speak), they're going to get some more sleep, but this time, with professional help. nick littlehales is sleepathlete, a company that not only provides the sportingly enhanced with advice on how to get a good night's worth, but has available a substantial range of sleep recovery products designed to do what it says on the box. or carry bag. 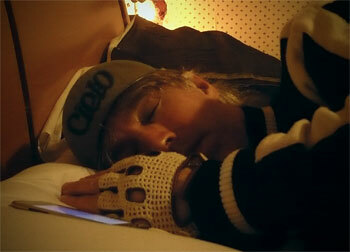 team manager/rider, rob hayles, needs little introduction to the possibilities: "sleep is a massive part of cycling. for me it's a third of the overall package, along with your nutrition and your training, so it's a big part of my strategy and hopefully it will be a big leap forward for the team as a whole.Ó you see, a professional racing team tends to move about a bit; something to do with races not being in the same place all the time. so while you and i can strip off those sweat-soaked shorts, jersey and baselayer at the end of giving ourselves a hard time and head upstairs to that lovely comfy bed, many a rider has little idea what sleeping arrangements await at the end of the day. 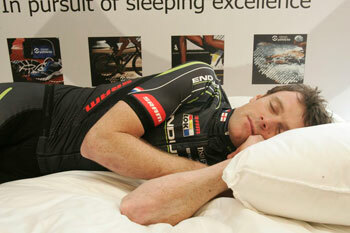 nick littlehales has over 25 years experience of sleep (nice work if you can get it), having worked with some of the premier division's top football teams (i just know there's a joke in there somewhere), but became involved with cycling when helen wyman started to take a more than askance glance at her sleep recovery. "at the time, she was travelling quite a bit to cyclocross races in various parts of the world, and started to become aware that her sleep patterns were anything but regular. we were able to help look at the possibilities. the services of sleepathlete have been capitalised on by a whole host of mainstream sports looking for the edge over the competition." 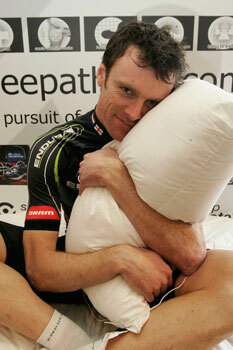 having mentioned that sleepathete has a not inconsiderable range of sleeping recovery products, as a special treat for the endura racing team, riders were supplied with sleepathlete pro-sound pillows which feature an ipod connection, designed to help them develop a sleeping and relaxation routine on the move. i cannot claim to have much in the way of difficulty geting to sleep at night, given that i usually need a rest after changing channel on the tv, but it's nice to have the opportunity to live just a tiny part of the life of an athlete, even if it is only the bit where you get to sleep like a log. i say this because nick was kind enough to send a pro-sound pillow to washingmachinepost cottage just in case i was tired. the pillow comes in its own carry-case, having been designed as a regular accompaniment to the competitive athlete no matter where he/she might find themselves after a bout of training or, perchance, racing. i am, if little else, a bit of a sceptic when it comes to this sort of thing; generally i'd be of the opinion that a pillow, is a pillow, is a pillow, and plonking your head on anything soft, white and fluffy of a darkened night is all that any honed athlete requires. the pro-sound rather blew that pre-conception out of the water on night one. i have never, in my entire life, laid my head upon such a fabulous example of sleep inducing softness; but it doesn't stop there. while disappearing into the land of nod has, as i have previously related, not been that much of a problem, if wakened during slumber, it's sometimes difficult to re-enter fuzzy-time, and for this i absolutely adore this pillow. the advent of the ipod has meant that, providing i remembered to take the darned thing upstairs in the first place, plugging in a pair of headphones can aid sleepy-time. but it's very uncomfortable lying on an ear filled with headphone, an inconvenience alleviated by the existence of a small speaker built into the pillow, connected to a lengthy cable and plug. the speaker causes no discomfort at all, and is quiet enough not to disturb a soundly sleeping mrs washingmachinepost. nick recommends fifteen minutes of music, sound (apparently white noise is very good) or speech, and no more. the desired effect is that the displaced athlete can take a little bit of home or audio comfort with them wherever in the world they may find themselves. it's this that aids the sleep recovery process. i love it, and i'm at home, so i can only imagine the benefit when other than where you might like to be. so it's not just down to getting a bit of a rest after velocipedinal exertion; there is a bit of science and consideration involved, and should your regime dictate that a closer look is warranted, sleepathlete and its attendant products would seem the intelligent place to start. the pro-sound pillow sells for £24.90 and comes complete with removable ipod cable attachment, internal speaker, and arrives in its own carry bag.